Not content to let Doom Eternal steal its thunder, Elder Scrolls Online had some new details to show at QuakeCon. We’ve got a full trailer for the next DLC expansion Wolfhunter, a quick glimpse at the Murkmire add-on, and a boost for regular subscribers of the ESO Plus program promising more generous rewards. Along with providing regular access to DLC and some other benefits, ESO Plus offers players a bonus allotment of 1,500 crowns – the real-money currency – every month. 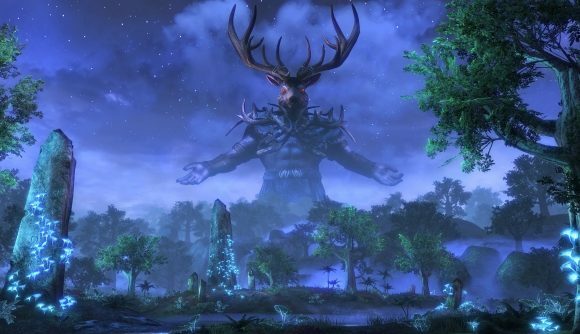 Alongside the launch of Murkmire, that will be boosted to 1,650 crowns monthly (presumably that will be extended to three and six-month subscribers, as well). Players will also now get a free item every month, and other “exclusive offers” in the Crown store. As for Murkmire itself, that expansion will bring a new story and zone to explore in the Argonian homeland of Black Marsh. Today offered a look at what the location will look like, along with the promise that we’ll see plenty more of the lizard folk and find out just what it is that makes them so peculiar once the expansion launches later this year. Here’s a brief look at Murkmire. Before that launches, however, we have the Wolfhunter DLC, which will have you going toe-to-toe with the Hircine and his werebeasts in the Daedric prince’s own realm. In practical terms, that means two new four-player dungeons to take on, along with appropriate gear and collectables as rewards. Wolfhunter releases on August 13. MMO faithful might recognize that as being just one day before the Battle for Azeroth release date. One of the two expansions might be a slightly bigger deal than the other, but at least you’ll have plenty of online options next week.